Those were the words of Eddie Jones last week as he discussed the 26-man training squad he had picked ahead of the test with Wales and his preparations for the tour to Australia this summer. As stands, Underhill is unavailable for England selection due to the fact he is playing his rugby outside of the country. His performances for the Ospreys is the Guinness PRO12 and European Rugby Champions Cup have been exceptional this season and it is believed Jones sees him as the man to solve England’s long-term issue at openside flanker, despite being just 19 years of age. Underhill has long been touted as a future star, having captained the England U18 side during his time in the Gloucester academy. He led the U18s to an unbeaten season that included defeating their South African counterparts in South Africa. 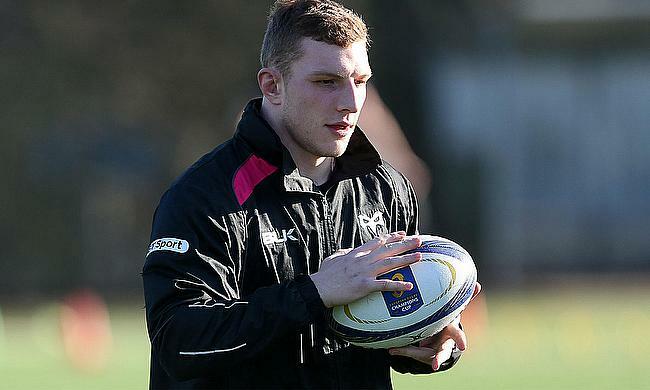 His subsequent move to the Ospreys has been a result of him choosing to study economics at the University of Swansea. This puts England and Jones in a tough spot. The ‘exceptional circumstance’ clause still floats around English rugby, despite never being used and never actually being clearly defined as to what constitutes an exceptional circumstance. The form of Steffon Armitage clearly didn’t for Stuart Lancaster and the RFU and the question now is whether or not the prospect of Underhill is one worth jeopardising the current health of English rugby for, something which has been brought back into vogue by the recently announced bumper TV deal for the Top 14 from 2019. Underhill, by all accounts, is keen to finish his degree and that leaves the player, Jones and England with a number of options. One is that Underhill would change universities or find a way to complete his degree remotely, therefore opening up the possibility of an Aviva Premiership side buying him out of his contract with the Ospreys. This seems unlikely as Underhill seems happy finishing his degree in Swansea but the lure of the England national team could make him amenable to transferring. The second option would be for Jones to invoke the exceptional circumstances clause and select him for England regardless. This would not please the Premiership clubs, as well as potentially opening the door to an exodus of players to the Top 14, which still has a significantly higher salary cap than the Premiership. The third option would be for Underhill to commit now to a Premiership side - but see out his current deal with the Ospreys - then head back to England following the conclusion of his degree. This would likely keep the Premiership sides appeased and provide a valid reason for invoking the exceptional circumstances clause and one that would likely not trigger an exodus of players. So, assuming that Underhill, Jones and England are operating with the first or last options in mind, which Premiership clubs would be a good fit for the young openside? Gloucester seems the logical place to start, having been the club that developed Underhill. He has shown this season his ability at blindside, dovetailing well with Justin Tipuric, and it is likely there would be a similar role for him with the Cherry and Whites, playing alongside Matt Kvesic. It would be a fine combination, but perhaps not the ideal fit, with everyone keen to see Underhill in the seven jersey week in, week out. Both Francois Louw and Julian Salvi have a number of good years ahead of them, potentially taking Bath and Exeter Chiefs out of the running, whilst Harlequins and Leicester Tigers both have a number of good, versatile options on their flanks. Northampton Saints also have their own logjam of talented flankers, with Tom Wood, Calum Clark, Teimana Harrison and Jamie Gibson all competing for two jerseys. Wasps are believed to be in the market for a new openside following George Smith’s decision to return to Japan and though they have been linked with Armitage, Underhill could be an appetising prospect for them. He would have to compete with Thomas Young, who has had a fine season, but there is potential for him to become a starter in Coventry. There is a similar story at Saracens, where Will Fraser has considerable ability but has struggled with injuries, and Underhill could represent a more durable option for them. Worcester Warriors, Sale Sharks and Newcastle Falcons are all clubs where Underhill would be in a good position to compete for a starting spot, but who have historically struggled for representation in the England team. Players tend to leave Sale and Newcastle in order to improve their England opportunities, not the other way around, but Worcester have been ambitious with their recruitment of late and Underhill could shine in their rapidly improving side. One wildcard would be Bristol, if they can secure promotion to the Premiership this season. Their proximity to Wales could make for Underhill completing his course at the University of Swansea remotely or on a part-time basis possible, whilst they also certainly have the financial muscle to buy the flanker out of his Ospreys contract. Teaming up Underhill with Jack Lam in the Bristol back row would be exciting and it’s hard to imagine Bristol won’t want to make a splash in their recruitment if they do secure promotion. It should be an intriguing story to watch play out between now and England’s Elite Player Squad announcement ahead of the autumn internationals and whilst it is easy to get caught up in what Underhill could bring to England and the Premiership on the field, time should be taken to appreciate a young athlete choosing to prioritise his academic commitments when the sporting world, it seems, is already at his feet.